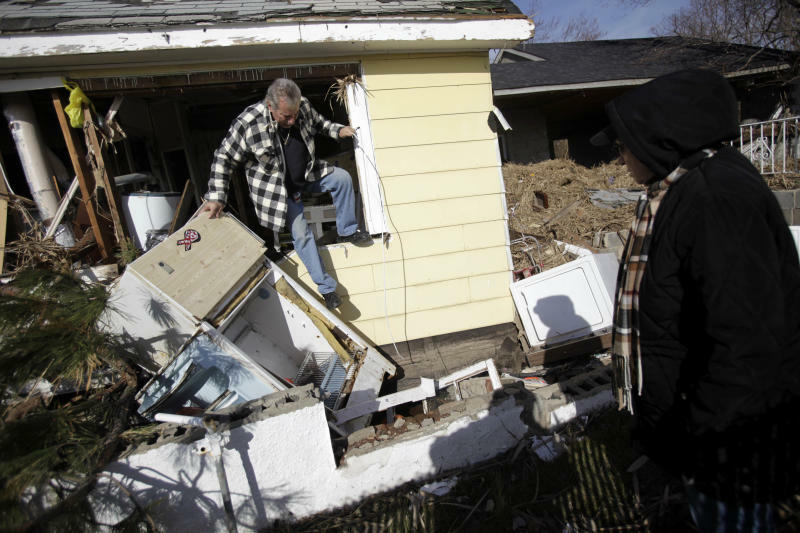 NEWARK, N.J. (AP) — Superstorm Sandy was the deadliest hurricane to hit the northeastern U.S. in 40 years and the second-costliest in the nation's history, according to a report released Tuesday. The storm's effects reached far and wide, according to the National Hurricane Center report. While Sandy visited devastation on the East Coast, principally New Jersey and New York, it created wind gusts as far west as Wisconsin and as far north as Canada and caused water levels to rise from Florida to Maine, the center found. The hurricane center attributed 72 U.S. deaths directly to Sandy, from Maryland to New Hampshire. That is more than any hurricane to hit the northeastern U.S. since Hurricane Agnes killed 122 people in 1972, according to the center's records covering 1851 to 2010. The report counted at least 87 other deaths that were indirectly tied to Sandy, from causes such as hypothermia due to power outages, carbon monoxide poisoning and accidents during cleanup efforts. The deadliest hurricane in U.S. history hit Galveston, Texas, in 1900 and killed 8,000 to 12,000 people. The report estimated damage caused by Sandy at $50 billion, greater than any U.S. hurricane except Katrina, which in 2005 caused $108 billion in damage, or $128 billion adjusted to 2012 dollars. Hurricane Andrew in 1992 caused $26.5 billion in damage in Florida, or the equivalent of $44 billion today. Tuesday's report describes Sandy's beginnings as a tropical wave off the coast of Africa on Oct. 11 that initially produced a wide area of showers and thunderstorms in the eastern Atlantic. It reached the Caribbean on Oct. 18 and gradually strengthened into a hurricane by Oct. 24. It temporarily weakened below hurricane strength while passing Cuba, then regained hurricane strength as it approached the U.S. on October 27. The storm grew significantly as it passed through the Bahamas on Oct. 25 and 26, so that by the time it reached landfall in southern New Jersey its gale-force winds covered a diameter of 870 nautical miles, or about 1,000 miles. While passing over Jamaica, it dumped up to 28 inches of rain in some spots. In the U.S., southern New Jersey, Delaware and eastern Maryland were hit the hardest, with the peak amount of rain measured at just under 13 inches in Bellevue on Maryland's Eastern Shore. More than 650,000 U.S. homes were damaged or destroyed by the storm, and more than 8 million customers lost power, according to the report. The highest storm surge measured by tide gauges in New Jersey was 8½ feet over normal levels at Sandy Hook, though it likely was higher because the storm knocked out the gauges, according to the report. The highest surge in New York was more than 12½ feet at Kings Point on the western edge of Long Island Sound.